My Boyfriend Hates Makeup: China Glaze - For Audrey - Classicly Pretty!! 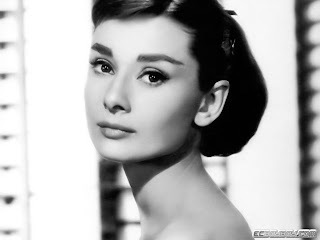 Who doesn't love Audrey Hepburn?? I bought a bottle of this for myself and also for my younger cousin, Mary. I sent this earlier in the month and she began high school on the 20th. My lil' cousin is one of the brightest, most level headed people I have met. She is beautiful, classy, and brilliant. Remind you of anyone?!?! Anyway, my note said that despite the pressures and the temptations of wretched people in high school (and in life!!!!!!) I hope that my cousin stays true to herself and remains the classy, poised lady that she now! 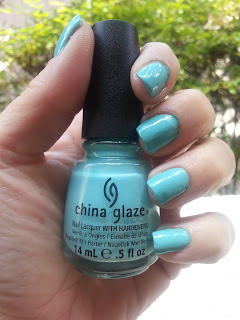 This is a light teal creme formula and after using this, I am convinced that China Glaze is one of my favorite formulas. I think CG is comparable to Zoya and OPI and I do find the CG formula to be my fave of those Big 3, LOL. I already went back to Sally's Beauty and snagged a couple other CG including Purple Panic, Hang-Ten Toes, and Pink Plumeria. I was going to top it with something as I was correcting exams (see notes about President Hoover) and I decided to try a couple options. 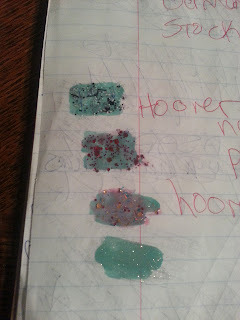 From top to bottom is: Connect the Dots by Lynnderella, Glittoris by Pahlish, Pinkie Promise by Rainbow Honey, and Jesse's Girl, a topcoat I got in a Surprise Swap box. 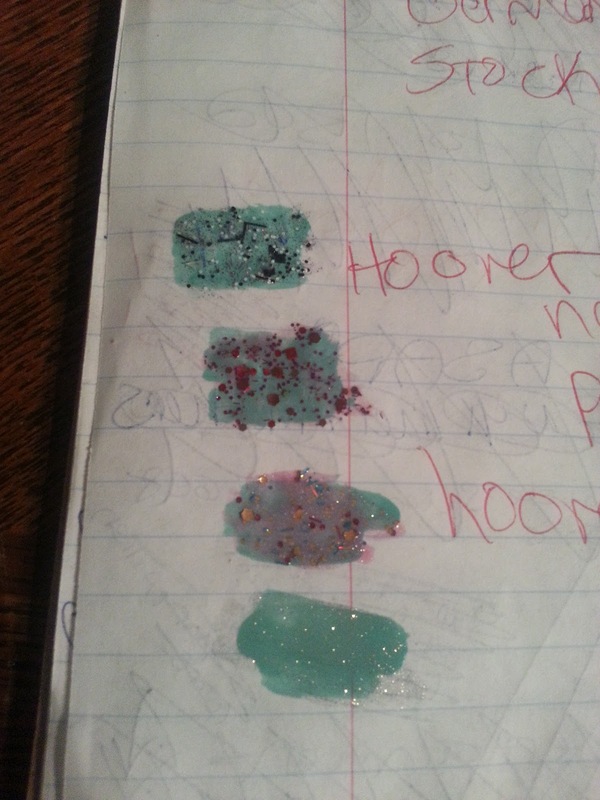 I went with Pinkie Promise and I'll show you the results soon....ooooohhhhh, teaser! !